Let's face it -- wood simply has this remarkable charm that ultimately gives warmth to any room in the house! We all love a little bit of wood in the house (or even a lot of wood), and we can't deny that it beautifies our interiors. Whether it's featured in the living room, the kitchen, or the bedroom, wood blends well even with the trendiest style in the market, the modern style. 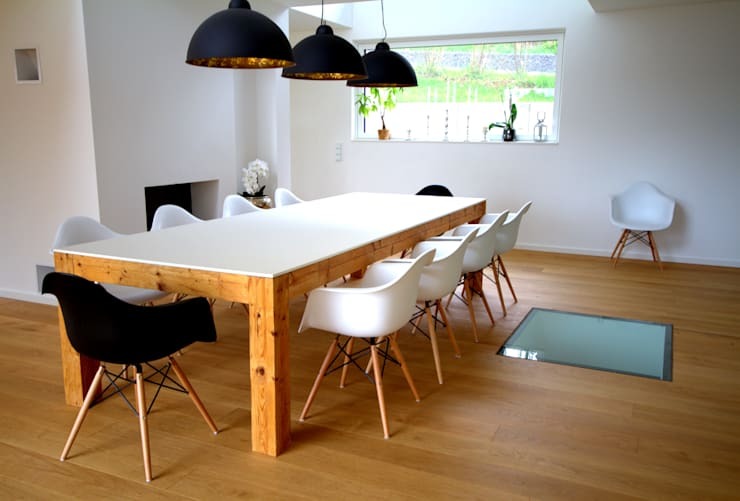 Today at homify, we're showcasing 12 stunning modern dining rooms that greatly use the elegant element of wood. Add a touch of coziness and earthiness to your dining room with these wooden ideas! 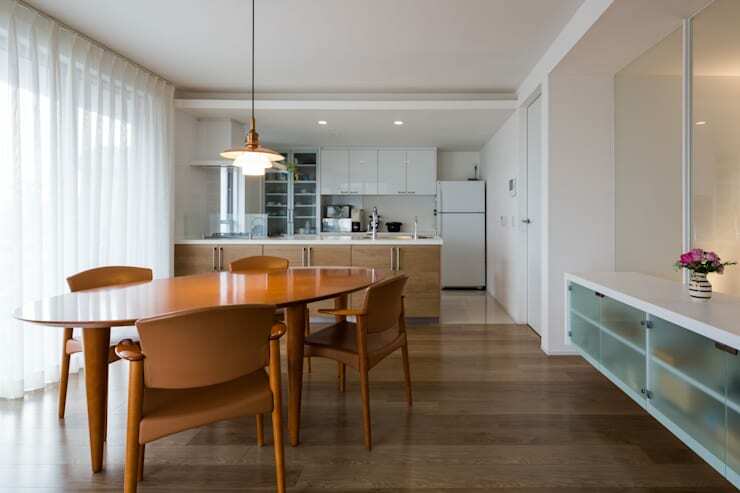 This simple dining room offers an abundance of wooden details from its sleek floors to the actual dining set. To spice up the room a bit, dining chairs and lighting fixtures are painted in black matte for the modern glow. What's a sophisticated room without its black and grey details? These two colors naturally makes any interior area elegant and matured. 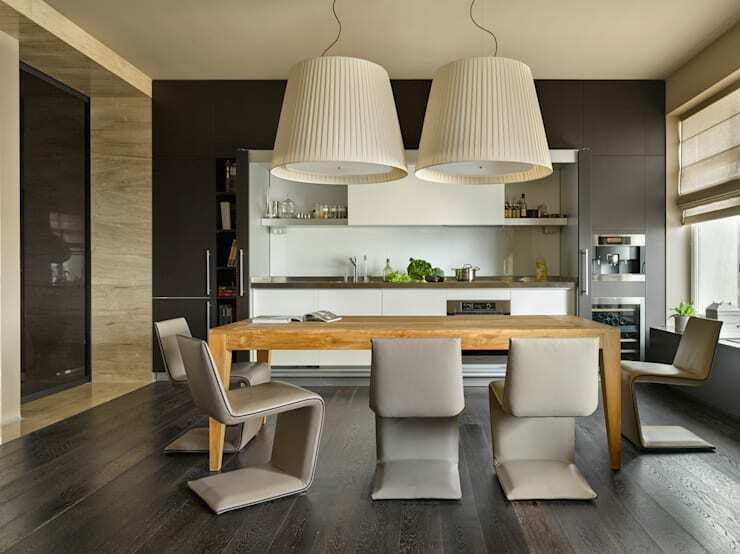 This dining room design boasts its posh grey and black hues along with the touch of wood through the dining table. Providing us with a more manly and bold approach, this dining room highlights its use of redwood. Thick legs and bridges of Mahogany make up this modern dining table, and is also incorporated in the structure of the dining chairs. To balance the boldness of the room, a cream-colored cotton rug is used to add softness. Wood can be further enhanced through designs, a mix of materials, and painted colors. This specific dining table ditched the paint and chose to opt for a much more natural glow through coating with shellac. 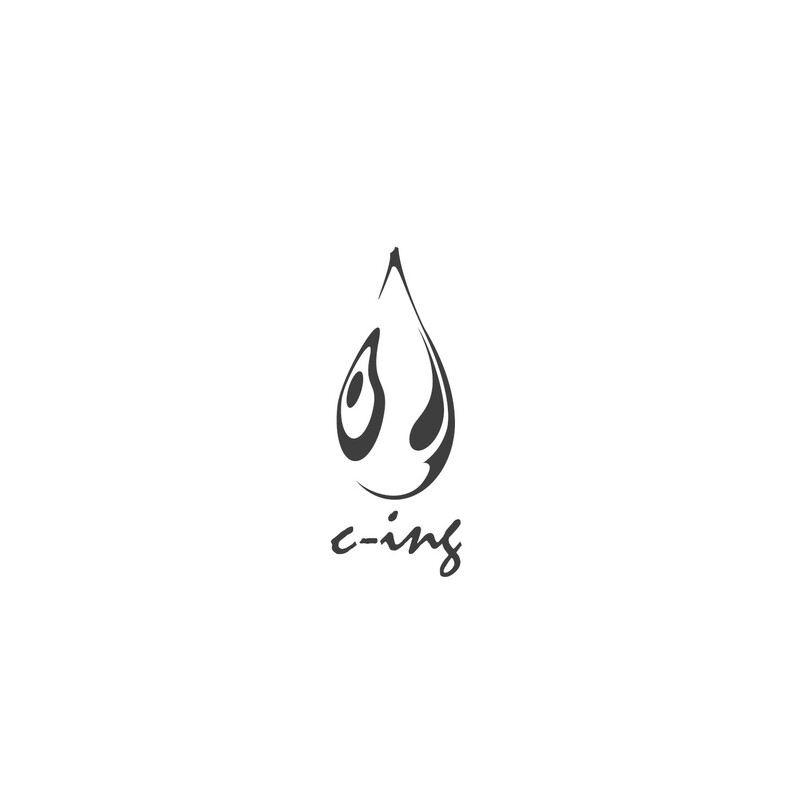 It provides a glossy finish to the wood that celebrates the natural state of the material. Your room doesn't have to look monotonous. 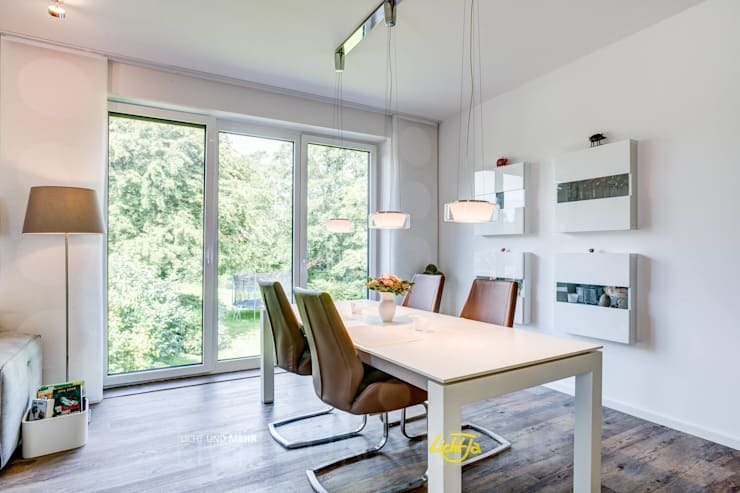 Check out this modern dining room design and notice how the dark wooden floors blend in perfect unison with the dining table made of light wood. Keep your eyes on the lower part of the picture and enjoy the sleek and natural-looking elements of wood in this dining area. The floors, dining table, and even the sofa from the living room all highlight wood as a genuine material. Now, look above and notice how wood plays contrast with the simplicity of the lower part. This wooden statement piece of art beautifies the ceiling and creates a grand design in the overall style of the room! While a neutral palette offer the best of modern style, adding a few pops of color wouldn't hurt either. In fact, it accentuates the contemporary and modern style even more! 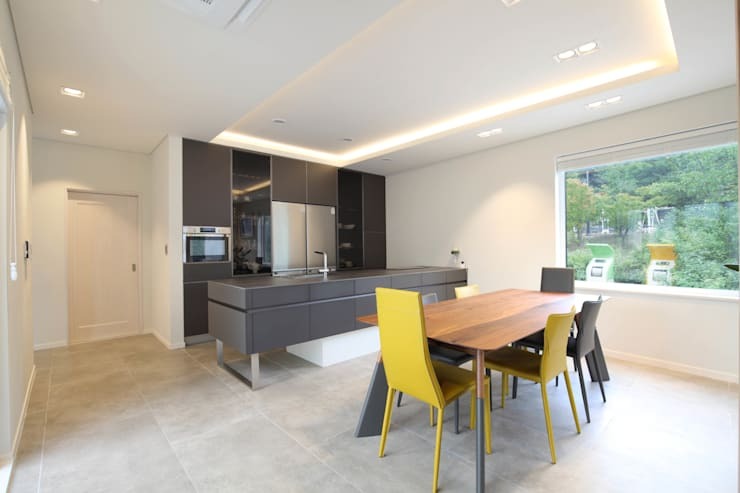 This stylish dining room design features black and grey as the base colors, and yellow as the accent color. 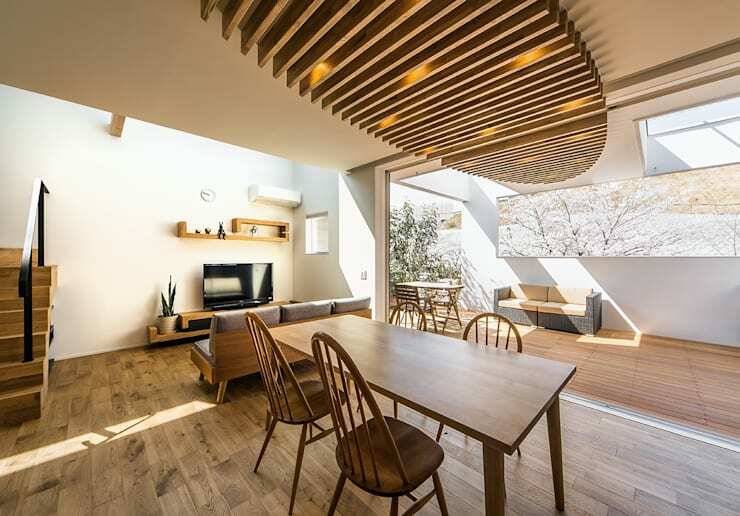 Of course, wood is used as the dining table in this design. 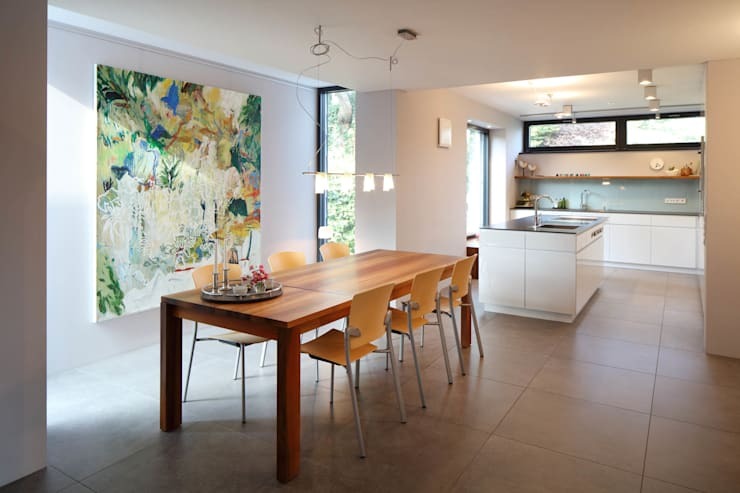 Another stylish and modern design we have in store is this dining room that features a big abstract work of art. It acts as an eye-catching component of the room the draws your eyes into it. The wooden details of this dining room can be seen in the furniture -- the dining table and dining chairs are made of high quality Narra which is abundant in the Philippine market. 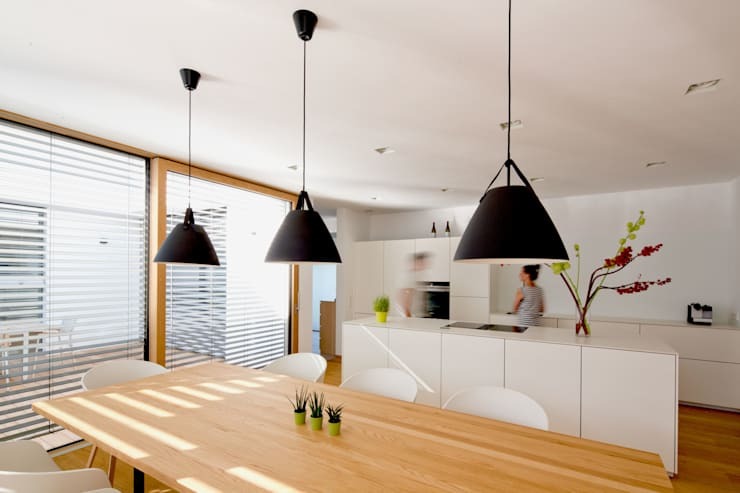 Give your dining room some industrial flare by adding pendant lighting fixtures made of steel. It blends in perfect contrast with the wide wooden table here made in light Oak. This dining room design features dark and rustic wooden floors that give a sense of warmth to the room. Designed by the sliding door that leads to the outdoor garden, this dining room is abundant in natural light and the crisp breeze from the outside. We featured contemporary, bold colors earlier. Now, here's a pretty and dainty dining room that features wood as its floors and a set of cute dining chairs in an array of tones. 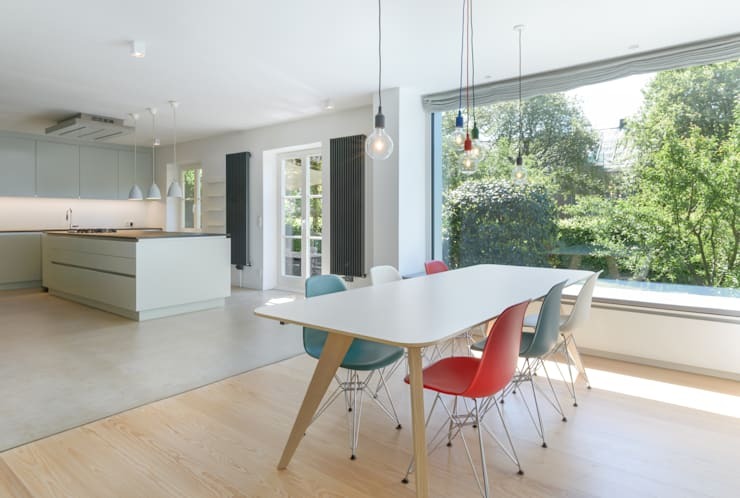 The chairs set a delicate vibe to the room and create a sense of tranquility along with the wooden floors. Since we're featuring modern dining rooms that make use of amazing wood, we thought of saving the best for last. 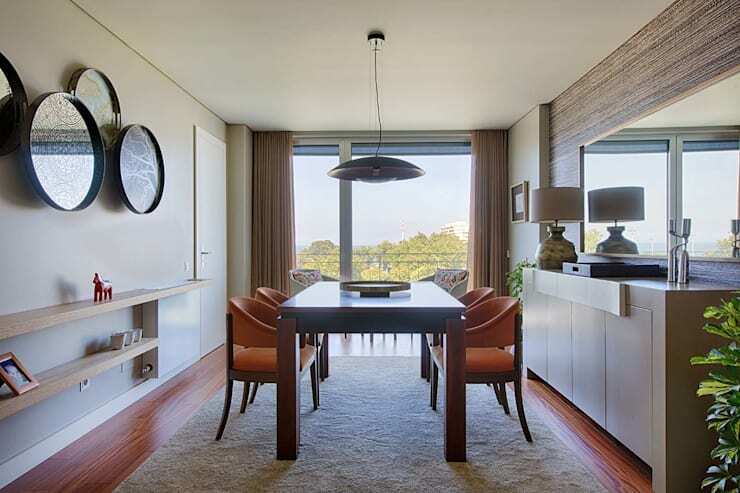 This wide and spacious dining room showcases its wooden details through the majority of components of the room! 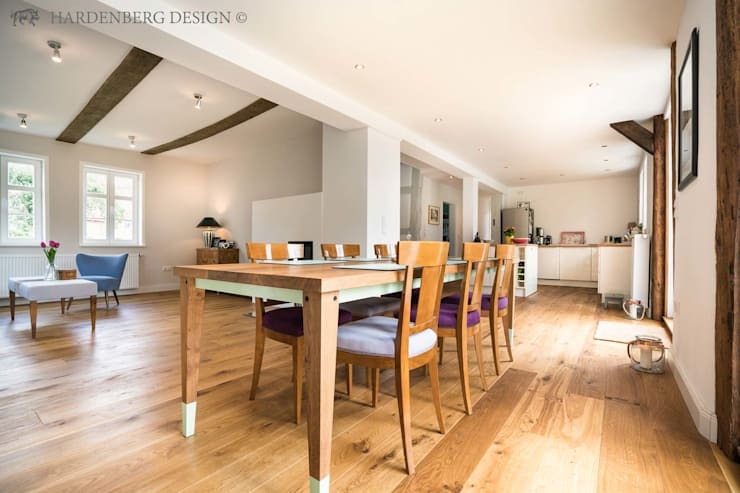 Flourished along the floors, dining table, and dining chairs, wood is greatly boasted here. Can't get enough of this ideabook? Here are 15 photos of delicious dining rooms decorated with wood!